Mindful of their footing, a committee of 10 men and women from the village of Tchanfieri in northern Togo step off the path and into the overgrowth. They look around bushes and behind trees. In no time at all, flies have alerted them to what they were searching for. 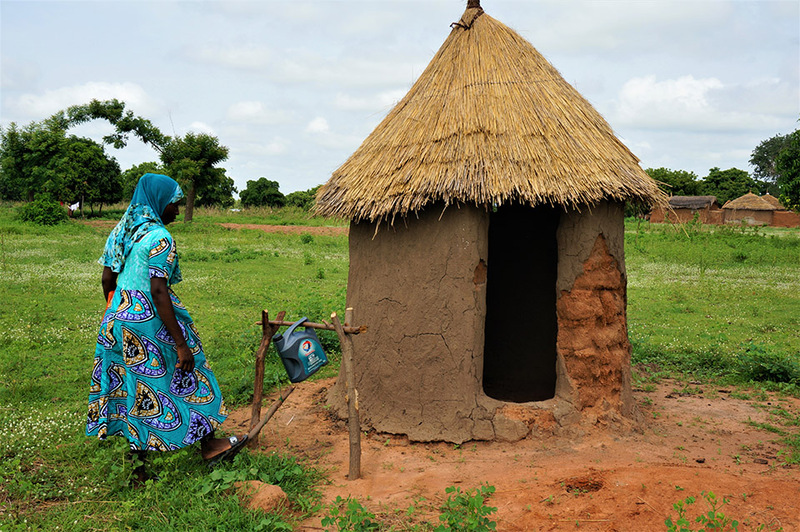 Eighty-eight percent of the 7.3 million people of Togo—over 6 million people—do not have toilets in their homes. If they do, the porcelain kind are an even greater rarity. Most often a toilet refers to an outdoor pit latrine, but even those are not plentiful. The World Health Organization and UNICEF report that 54% of the Togolese population defecates in the open, leading to epidemics of cholera, typhoid and other diarrheal diseases, and causing hundreds of preventable deaths each year. Faouziatou Ali, the social worker and project facilitator working with them, points to the ground and the swarming flies. This is her teaching moment. “So, when these flies enter your home and land on the food, what are you eating?” she asks. Once they understand what she is implying, responses range from laughter to disgust to shame. It’s shocking, but that is exactly the point. Faouziatou is using an unconventional yet effective behavior change strategy called Community-Led Total Sanitation, designed to encourage communities to stop the practice of open defecation. implementing the project in 211 villages in northern Togo, reaching approximately 160,000 people. When the committee’s “walk of shame” ends, they must explain to their community what they’ve realized. The village is shocked by what the volunteers tell them. Next, Faouziatou illustrates the lesson with a community mapping activity and cost analysis of a family’s loss of income each time a child falls ill with diarrhea. The project emphasizes that even if a small minority of the population continues to defecate in the open, everyone in the community is at risk. 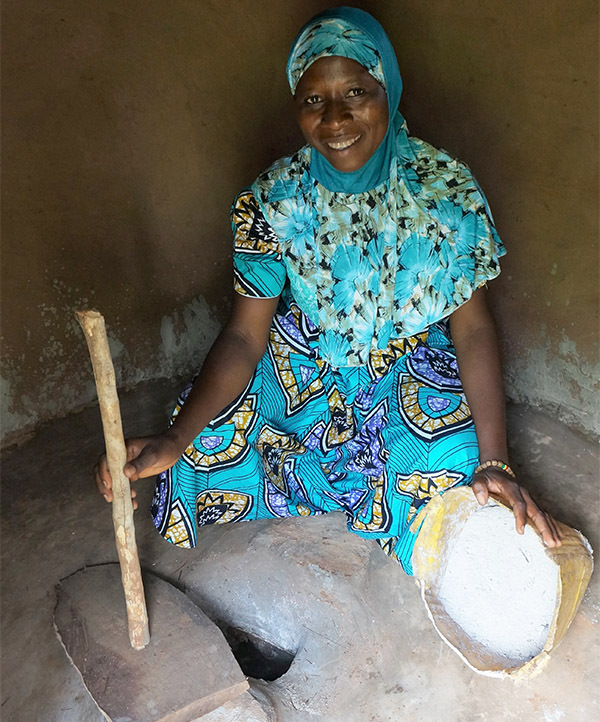 At the end of the training, Faouziatou demonstrates how each household in a community can build a latrine with locally available resources for zero cost. Before Faouziatou departs, every household makes a commitment to begin building their latrine. She follows up several times in the ensuing weeks to make sure everyone is on track. And she will continue to work with the village until every household has a latrine and they are declared open defecation free. Several weeks after their initial meeting, the village of Tchanfieri is well on its way to reaching the desired sanitation status. Its residents have put their words into action and are happier and healthier as a result. “They were in a hurry to use their latrine,” Faouziatou says. Faouziatou Ali inspects the nearly completed latrine and hand-washing station in the village of Tchanfieri, Togo. Open defecation is especially harmful to children, who come into contact with it while out playing in their communities. Togo has one of the highest mortality rates for children under age 5. According to the World Health Organization, 9% of those deaths are caused by diarrheal diseases. 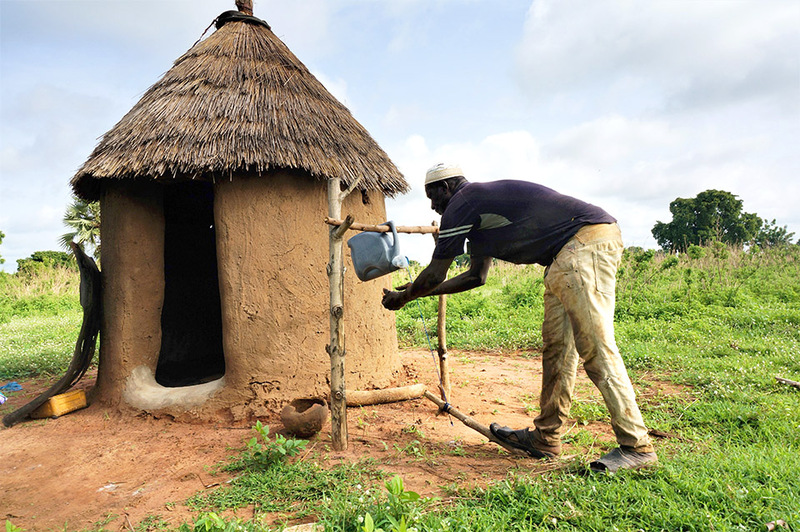 Forming a new habit is not easy, but Salou Mamoudou and his wife Aguichi Koffi now understand the importance of using a latrine. They encourage their children to use the latrine every time so that all children in their community can remain healthy and safe. “Before, the children would defecate in the courtyard, or wherever they wanted. Now they know to use the latrine,” says Salou. 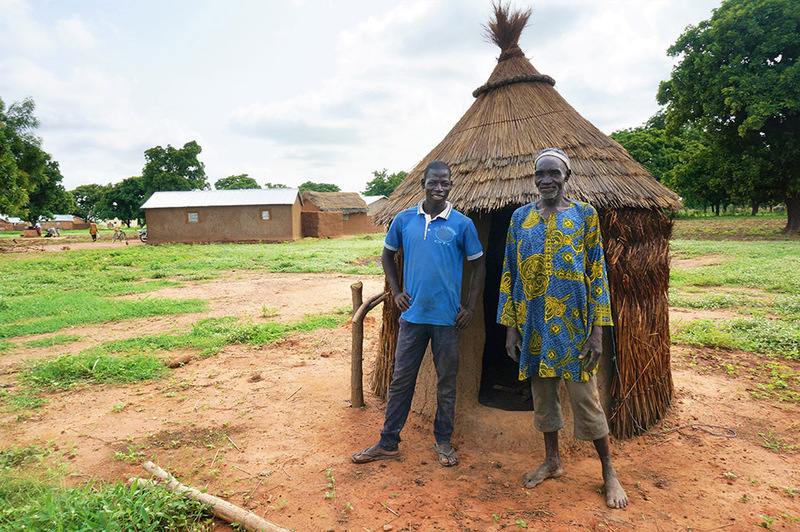 Salou Mamoudou and his wife, Aguichi Koffi, take a break from field work to pose in front of their latrine with their two children. But Faouziatou’s message struck a chord with her son. “Shortly after attending the meeting, he began digging the hole for the latrine. With the help of some neighbors, he formed mud into bricks and constructed the enclosure. When he was finished, I helped plaster the exterior, weave the straw roof, and cement the floor,” Adizetiou says. Recycling an old sleeping mat as a door, Adizetiou did not pay one cent for the materials or labor to construct her latrine. 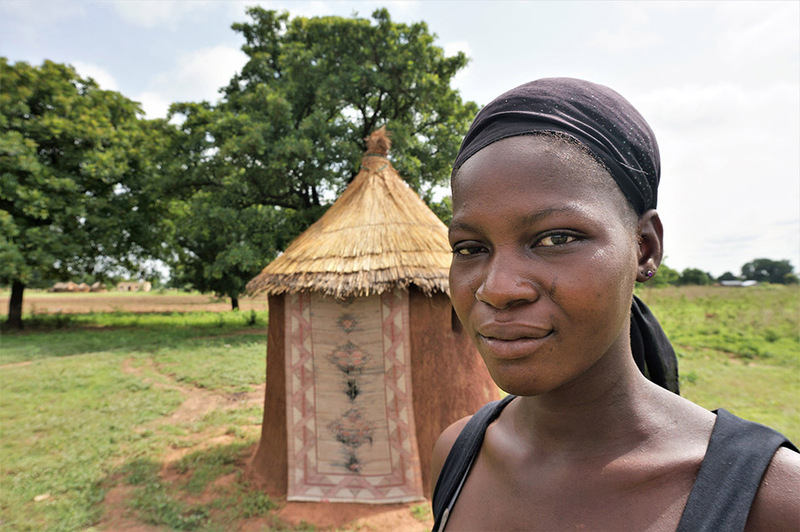 Adizetiou Tapandja in front of the latrine that she and her son constructed together. With the rainy season approaching, it is important to complete latrine construction as quickly as possible. Rain increases the risk of contamination of nearby rivers or ponds, the same water used for drinking, cooking, bathing and cleaning. At 70 years old, Koame Koffi is determined not going to let rain damage the latrine he worked hard to build. Instead, he uses his weaving skills to create a thick straw shield to protect the exterior of his latrine from future storms. Koame Koffi and his neighbor Abdouwahabou Awari in front of his latrine. A nomadic community of herders opted out of mud walls and instead based their latrine design off their own homes. Traditionally constructed from woven straw mats, the exterior of their latrine is similarly constructed with lightweight, portable materials. The large branches surrounding the latrine serve as additional protection from their herd of free-range cattle who occasionally pass through. 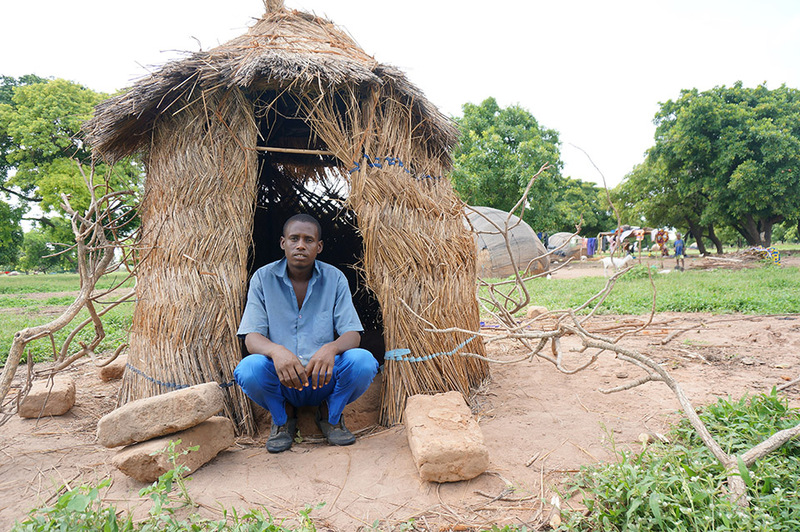 Amadou Djallon rests at the entrance to his family’s latrine. Even with its unconventional methods, the program has been very effective—90% of the population has access to their own private latrine. “It is not a bad thing that we are asking people to do. This is a good thing for their health and for the community. I see it as the work of God,” says Faouziatou. For the past year, CRS has been helping communities adopt these new behaviors. Through a network of 75 local facilitators like Faouziatou, all 211 rural villages across northern Togo have been reached, with special attention to students at 181 primary schools. So far, 10,500 new latrines have been constructed benefiting over 100,000 individuals—many of whom now reside in villages that are certified open defecation free. Ichakou Koami demonstrates how his hand-washing station works. When he steps on the wooden lever, a jug of water tips slightly and pours water onto his hands. Long-term health outcomes are dependent on these villages maintaining this status. To encourage families to invest in their health and well-being, local shop owners and artisans have teamed up to bring sanitation products closer to users. Now, concrete latrine slabs and covers are available for purchase by these communities, reinforcing the likelihood of sustaining improved sanitation practices. When Muslims enter a mosque, they are required to wash beforehand to be clean before God, Ichakou Koami, the local Quranic teacher explains. “Thanks to this project, now there is more cleanliness in our community,” he says.